Whether you're trying to protect your children, safeguard your marriage, or break bad habits, Truple can help. Truple changes the way I use my phone. Knowing that Truple is always watching ends up preventing judgement lapses—I now avoid anything questionable with ease. This was the App that made it seem like my husband could have a smartphone and keep some accountability. So many others are easy to get around, but the potential of a screen shot at any moment seemed to stick. Truple helps me remain accountable for everything on my screen, not just what is recognized by a filter. Screenshot Accountability is much more comprehensive than other forms of accountability for internet devices. Using other types of internet accountability, I was always able to work around them in one way or another. Truple seems to be more foolproof and simple. I can use the internet now. Truple monitoring is available for Android and Windows devices. 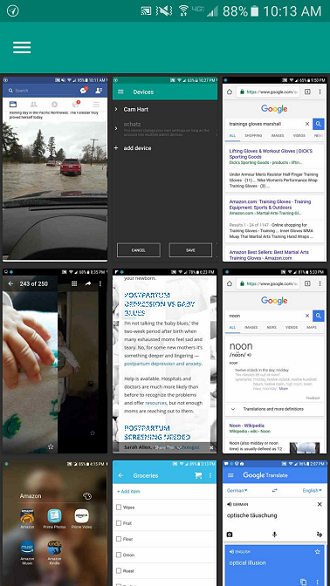 Screenshots can be viewed through the Android app OR online at https://app.truple.io. Want Truple for iPhone / iPad, Kindle, Mac, Chromebook, Linux? Enjoy discounted pricing while we're in beta! * a monitored device is a device which has screenshot capturing enabled. Currently you can only monitor android and windows devices. Highest rated accountability app in the Google Play store. Read the reviews! No crazy reports, simply scroll through screenshots from the past 24 hours. Instagram, Facebook, Twitter, Pinterest, Snapchat, etc. all get content captured. Start signing up and select the "Want a 14 day free trial?" button. Screenshots are sent over HTTPS and stored using AES 256 bit encryption. 8000+ banking sites blocked from screenshots, optionally redact text from images and blur screenshots to maintain privacy and protect your accountability partner from graphic details. The app uses minimal battery, ram, processing power, and data. To learn more, please check out our Frequently Asked Questions page. Subscribe to our mailing list to receive feature updates, platform releases, and blog posts in your mailbox! Please contact support@truple.io with any questions.